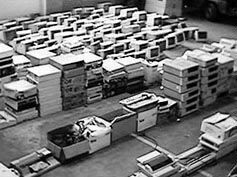 In April 1998 RTI occupied a warehouse in the centre of Sheffield and accumulated computers for our largest installation to date - Redundant Array. This piece developed out of two previous installations, that were featured in the Size Matters show - James Wallbank and Redundant Technology Initiative's "Falling Down" plus "The Deconstruction of New Technology" by Paul Matosic with John Denaro. 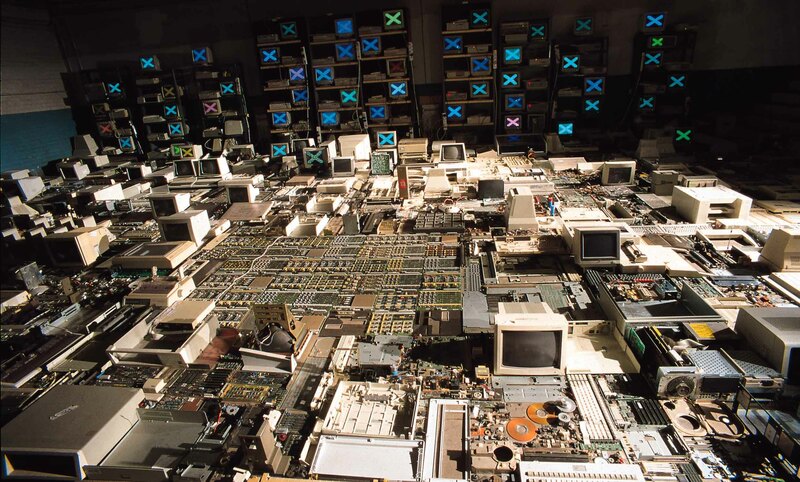 We had planned that the piece would make use of one hundred donated computers, but in the event we used nearly twice as many, more than 50 of which were active simultaneously! The piece was open to the public as part of the Lovebytes 98 digital arts festival. As Paul Matosic and James Wallbank constructed the installation in Sheffield, John Denaro made a parallel installation in Loughborough's Gallery of The Future. 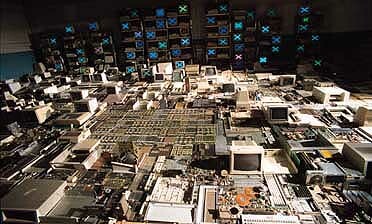 This second installation, "Hard Copy" was made up of images of the developing "Redundant Array" sent to him via a continual stream of faxes. John, with the aid of a photocopier, transformed these images, pasted them into "Hard Copy" and faxed them back to "Redundant Array" - creating an installational, multipley redundant, obsolete technology feedback loop! Now we're looking into ways of developing this networked way of working for future projects. As well as the three artists involved, substantial credit should also be given to Tony Goddard, who did the "C" programming for the piece, and to Alex Atkin and Chris Moxon, our TriTec work placement students, who got the computers up and running.